Upon entering the world of high school, I was constantly hearing about University of the Philippines College Admission Test or UPCAT. But in my first two years as a student, I was not that anxious about it until the middle of junior high when most of us started talking about college entrance exams that we will be taking in a few months time. I’ve been preparing my self for these exams since then because I believe that having a ”master plan” to surmount UPCAT is a good start for greater result. Having a background about the test is the most important thing to do as the first step of the master plan. Surfing the internet would be a great help in looking for online reviews, tips, ideas about the coverage of the test and as well as the requirements the university is expecting from an applicant. Once I knew how inimitable UPCAT is because of its checking formula—a fourth of a point will be deducted for every wrong answer you have, I felt a bit tense and began hesitating to use my guessing strategy or not. But when I read about a tip on guessing answers on the academic clinic, I learned that this would not be a hindrance and should not make us back off. Learning this tip and many others from the internet will also help in conquering UPCAT. Seeking advice from seniors and other people who has knowledge of UPCAT is also a good step. Their personal experiences and instructions can help me in forming effective strategies to stand under the pressure of UPCAT. As soon as I heard some of their experiences, I had a better idea on how to face the test. Doing well in high school is I think the heart of the master plan. Come to think of it, if a student did not study diligently in high school, and he encounters a test like UPCAT? Can he rely on the stock knowledge he has? Unless he is really intelligent or genius, this can’t assure his success in the admission test. It’s really hard to take a particular test if we did not study about it. Besides, the university will also depend on our high school grades as a basis for our acceptance or rejection apart from UPCAT performance. As I was writing this essay, I’ve come to assess all that I have learned at studied so far, which subjects I still need to work on and review. Taking online review will also give me an idea on the type of questions I can expect on the admission test. In addition to the above mentioned strategies, I am also looking for other review materials and hand outs that I can browse and read during summer, I’m also thinking of enrolling in a review center that will greatly help me brushing up lessons from the past and I will be consulting the academic clinic about this. Lastly, apart from all these strategies of mine, I will never forget to depend on God. I’ll ask Him to guide me and give me enough wisdom and time to prepare for this exam and I’ll continue praying to Him for my success in this test because I believe that He’s the only one I can hold on to when everything seems unsure. As what they say, “He who fails to plan, plans to fail. ” It pays to plan ahead. It wasn’t raining when Noah built the ark. Having a master plan that we can follow is a good shot in preparing for UPCAT. It depends on our plan and of course God if UPCAT will be a dream or a nightmare for us. This contest is open to all incoming senior high school students (or equivalent) who are17 years old and below. Contestants must write an essay that revolves on this topic: How I plan to conquer the UPCAT / My UPCAT Master Plan. Contestants must give his or her essay a unique title. Essays may be written in English or Tagalog. There are no maximum or minimum number of words. 1. Become a fan of Academic Clinic (http://www.facebook.com/academic.clinic) and Brain Train Review Center (http://www.facebook.com/braintraincenter) on Facebook. 2. Contestants who follow Brain Train on Twitter (@bra1n_tra1n) get plus points as Brain Train’s Choice. 3. Contestants who post “Joining @Brain Train Review Center and @Academic Clinic’s FREE UPCAT Review Contest!” get plus points as Brain Train’s Choice. * If winner wants to avail of his/her prize at a venue other than those specified above, he or she MUST pay a minimal fee of P1,600.00 to cover review venue costs. ± If a winner turns out to be already enrolled in the Brain Train UPCAT Review Program, then his or her registration fee will be refunded – provided that P1,600 will be deducted from the refunded amount if the student is enrolled in a venue other than the venues specified above. Prizes are non-convertible to cash and non-transferable. Academic-Clinic.com will announce the 3 winners at Academic-Clinic.com as well as in the Academic-Clinic.com Fan Page on April 22, 2012. We will also email the winners. Winners must then coordinate with Brain Train Review and Tutorials ASAP to claim their prize. Winners must not hesitate to contact Academic-Cinic.com if they need help coordinating with Brain Train Review and Tutorials. Prizes not claimed until April 30, 2012 will be voided. FREE UPCAT Review from Brain Train and Academic Clinic! Want to have the same advantage as they did, for FREE? Here’s how it works. Like all essay-writing contests (duh! ), contestants must write an essay on a specific topic. Three winners will be selected – and each of these three winners will win a FREE UPCAT Review*± with Brain Train Review and Tutorials! Sounds like a sweet prize? Well then, put your thinking cap on, take paper and pen out and start writing your mind-blowing essay! Take note that this is the topic around which your essay must revolve. However, we expect you to give your masterpiece a unique title. Contestant must first become a fan of Academic Clinic and Brain Train Review Center ) on Facebook. Winners must then coordinate with Brain Train Review and Tutorials to claim their prize. Winners must not hesitate to contact Academic-Cinic.com if they need help coordinating with Brain Train Review and Tutorials. Brain Train Review and Tutorials is furnishing the prizes for this particular contest. All entries will become property of Brain Train Review and Tutorials. Brain Train Review and Tutorials reserves the right to use all entries on their website as well as on other venues for marketing purposes or for any other purpose. 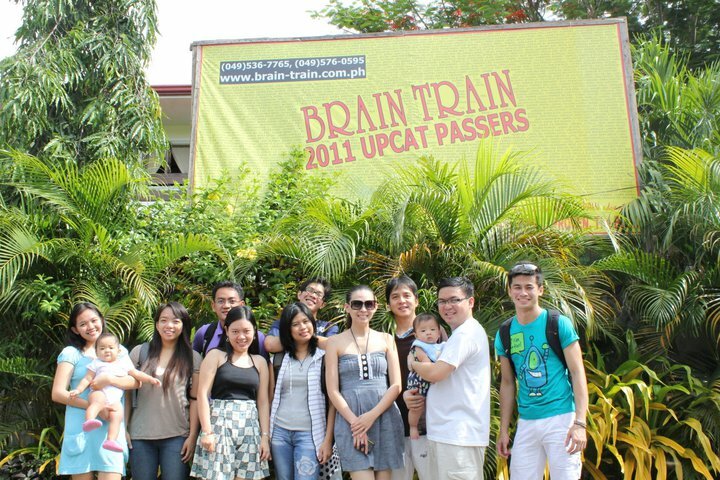 For more than a decade now, BRAIN TRAIN Tutorial and Review regularly publicizes its list of UPCAT passers. The names of UPCAT passers are placed on a huge, yellow tarpaulin and posted in every BRAIN TRAIN review venue. What was supposed to be just an advertisement turned out to be a tourist spot! We’ve seen several BRAIN TRAIN UPCAT passers posing beside this huge yellow tarpaulin, and even making it their profile pic on Facebook! Sometimes, motorists even stop and stare at the list, looking for a familiar name. Apparently, we didn’t expect that seeing their child’s name on this yellow tarp means so much to parents. In fact, about 2-3 years ago, a father called us asking why her Brain Trainee daughter who passed UP Diliman wasn’t on the tarp. We apologized for the oversight, but he insisted we put her daughter’s name on the tarp…dream daw nilang makita yung name ng anak nila sa yellow tarp na yun (mas importante pa sa website ng UPCAT, haha)! So we did on the tarp that is in their municipality. After a week, we received another call again…bakit daw wala sa tarp na nasa Calamba! Nung dumaan daw siya, hinanap niya dun! Haha. We were amused, even flattered that the BRAIN TRAIN yellow tarp is a HUGE deal. My mom told me that it indeed is a HUGE deal, and that we SHOULD add the name. At that time, Randy and I still do not have our Raviv, so I guess we weren’t that sensitive to parents’ feelings. When the 2012 UPCAT results were released last week, we received so many “thank-you” comments on Facebook., and even “thank-you” phone calls. One parent I talked to (barely 24 hours after the release of the UPCAT results) told me that she can’t help calling us and dropping a word of gratitude. Mother of Brain Train UPCAT passer: ”May tarp na ba kayo ng passers sa may Real (Calamba City)? Dadaan dun mamaya ‘yung mga kamag-anak ko, sabi ko tingnan”. 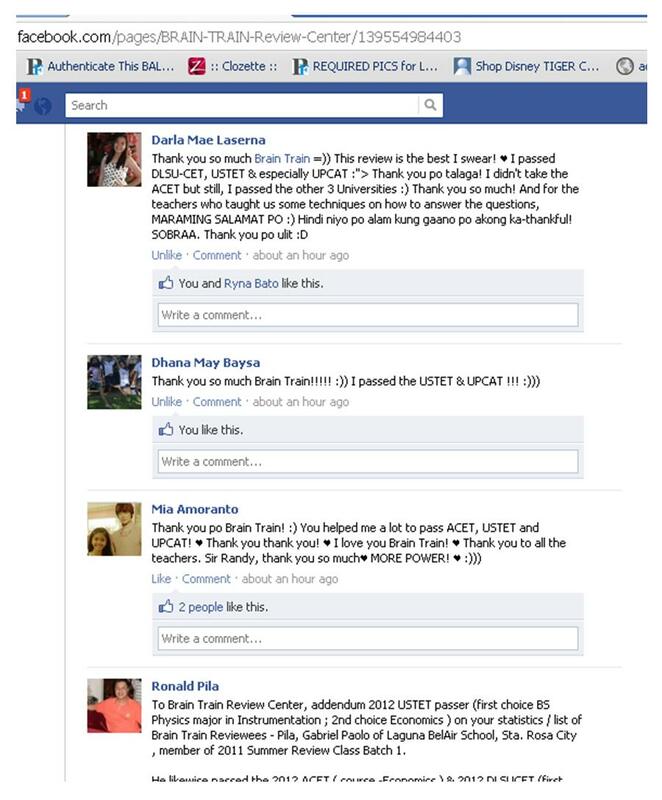 Anyway, our staff gathered the names of the 2012 BRAIN TRAIN UPCAT passers. Here they are. Please check your/your friend’s/your child’s name, as this list will be the basis of THE tarpaulin. If our staff missed it, please put the name on the comment section so we could include it. From all your Brain Train teachers, a thunderous “CONGRATULATIONS” to all of you! Thank you for getting that BRAIN TRAIN advantage! Mwah! * Eala, Ma. Isabelle Jillian * Ebora, Zeus Joseph * Ebron, Ezra Daniel * Ednave, Pamela Denise* Edquila, Rhea Pamela * Edward, Kyle Harrieth * Elegado, Christopher Patrick * Elemos, Pia Angela * Embalsado, Martha Inna *Endaya, Jo-Christine * Enrile, Angeli Grace Cleofe * Enrile, Maria Pilar * Enriquez, Abegail Imee * Epanto, Fatimah * Escala, Chaldea May * Escandor, Ma. Cristina Ysabel * Escosia, Zhalom Amour * Esguerra, Claudine * Esguerra, Exekiel * Esmalde, Mira * Espera, Tristan Paul * Espiel, Abby Mae * Espinosa, Phillip John * Espinosa, Yna *Espiritu, Kaye Samantha * Estolano, Mel Jean * Estolloso, Karlo * Estorque, Jet Joshua Lenard * Estrada, Vince Alfred * Estrella, Carmela * Estrologo, Ellan Blue * Estuart, Andrea *Eugenio, Francheska Angelene * Evangelista, Christine Angelica *Evangelista, Jobel Mira * Evangelista, Reginald Jr. This is IT! THIZ IZ REALLY IZ IT IZ IT! This is the day that the Lord has made where about 10,000 high school seniors are rejoicing, but around 60,000 are in sorrow. But then, of course, not all of our students could pass the UPCAT. 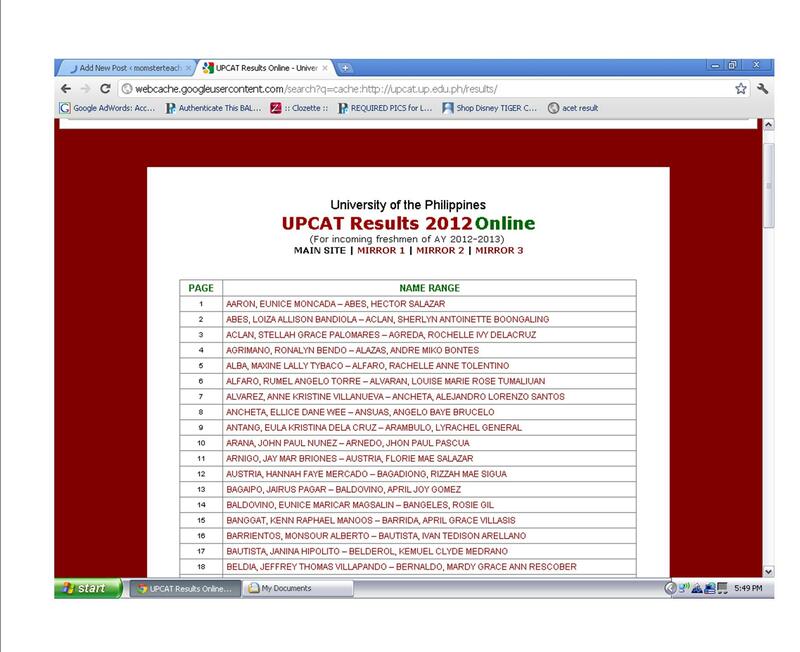 When I searched for the names of some students who I especially wanted to pass the UPCAT (of course I want EVERY ONE of our students to pass the UPCAT but there are some who I think really deserve to) and didn’ t find them, my heart started bleeding. Seriously. Dumudugo talaga ang puso para sa kanila. I honestly feel ashamed of myself—nagawa ko na ba lahat? Baka kung sinabi ko ‘to, or ginawa ko ‘to, baka pumasa siya. I fear that they would blame me and my colleagues for not passing the UPCAT, and that when I bump onto them on the streets, I’d run out of words to say, even with my natural kadaldalan. Because what do I tell them? Do I tell them, “Hindi mo kasi ginalingan siguro.” or “Hindi ka siguro nakinig sa akin ‘no?” Or if I tell them, “Baka pasok ka sa waitlist”, would that appease them and give them further hope (although of course, you know that despite not being on THE list, there are several ways of still getting in. Alam na ninyo ‘yun, di ba?) But for now, I guess I just have to say, “I did my best, I really did. If you did your best, your absolute best, then you should have no regrets. I am sorry that you did not make it, but my regard for you did not decrease. In fact, I dare tell UP: ‘Shame, shame! You should’ve gotten him/her! What a loss–you don’t know what you missed, UP!’”. While passing the UPCAT makes one a step nearer to having a great career and people thinking of you highly, it’s JUST A STEP. UPCAT passers, remember how much you wanted this moment…‘yung ia-update mo ‘yung Facebook profilemo at lalabas sa News Feeds at Top Stories ng lahat ng friends mo na, “Blah blah blah added the University of the Philippines to his schools”. Saya ‘di ba? But again, it does not end there. You are just beginning. I know for a fact that the intellectual freedom (and for many, the freedom from parents) that UP offers can make you or break you. And because your tuition fee will be partly (or wholly) shouldered by the sambayang Pilipino, make sure you make yourself worthy. I am not being holier-than-thou here. Honestly, I was the opposite of what I’m advocating you to be when I was in college. And it did not take me long to regret it. I guess that’s one of the reasons why I devoted myself to working in an NGO for quite a while, sa arte kong ‘to. Graduating from UP will be a huge advantage–that’s a fact. But, that’s just what it is–AN ADVANTAGE. It does not necessarily define you. Remember, the Sorting Hat also told Harry Potter ”You could be great, you know, and Slytherin will help you on the way to greatness, no doubt about that.” Meaning, Harry still would have been great even if he ended up in Slytherin. Or notice that even if he didn’t go to Slytherin (the house that was supposed to be the bridge to make him great), he still became great. And, both Ninoy (not P-Noy) Aquino and Ferdinand Marcos were UP alumni, but history describes them very disparately. Basta UPCAT passers, please remember that UP was created to produce quality graduates who are supposed to help make the Philippines…again, the PHILIPPINES, a better place. Tandaan ‘yan!